Remember When... The UFC Made Its Brazil Debut? 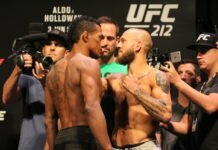 Home Opinion Remember When… The UFC Made Its Brazil Debut? Remember When… The UFC Made Its Brazil Debut? Regardless of how obnoxious certain aspects of modern day professional MMA and the UFC can be, we can always go back to a simpler time, remembering when… the UFC held their debut event in Brazil. Certain aspects of following the highest level of professional mixed martial arts in 2017 are annoying. Whether it’s problematic trash talk, incessant coverage of said trash talk, or a variety of other factors, we find ourselves recalling a simpler time. Not necessarily better, just different. The way your significant other talks about that one ex they can’t just shut-up about? That’s how we feel about “the good ol’ days” of MMA and the UFC. The sport is always changing, and moving toward the mainstream will only add to the list of things shedding their skin in favor of a more widely appealing product. Some of these changes are good. Some are not. Regardless, memorable past bouts, events, and moments are frozen in time. Unable to be touched by the circus that surrounds the momentous occasions of MMA today, these are the times that shaped and created the sport we love. Each week, we’ll go back to those times, recalling a specific fight, card, or moment relating to what’s going on in MMA today. This week, we’re taking a look at the UFC’s debut event in Brazil, UFC Brazil: Ultimate Brazil. Also known as “UFC 17.5”, the UFC’s Brazil debut had all of the ingredients for a quality card that we’ve come to know and love today. 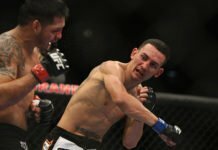 Two title fights, some talented locals, and a fresh event structure all paved the way for cards like UFC 212 this weekend. UFC 212 will be the 29th event held by the promotion in the country, and the 8th from Rio de Janeiro. Featuring Vitor Belfort in the same slot on the card as UFC Ultimate Brazil all those years ago, it is the promotion’s first event in Brazil since UFC Fortaleza in March. But, it all began with a pay-per-view card in Sao Paulo, back in October of 1998. REMEMBER WHEN…. THE UFC MADE ITS BRAZIL DEBUT? There are many reasons to remember the UFC’s debut in Brazil. From the quality of the card, to the format, to the location, everything about UFC Ultimate Brazil was special. While it wasn’t the first event to do so, not utilizing the promotion’s original tournament format was one of the biggest differences between Brazil’s debut card and the events fans were used to. Throw in the likes of Vitor Belfort, Wanderlei Silva, and Pedro Rizzo early in their careers, and it’s easy to see how the promotion and Brazil got along. UFC Ultimate Brazil was the second international event for the promotion, nearing its five-year anniversary at the time of the card. Following UFC Japan: Ultimate Japan in December of 1997, UFC Brazil was exactly the kind of card the promotion needed for such an occasion. A big reason that’s the case is Frank Shamrock. In the main event of UFC Ultimate Brazil, Shamrock defended his then-middleweight/now-light heavyweight belt against John Lober in a rematch of a fight in another promotion from January of 1997. Shamrock lost that first bout, a split-decision in Lober’s post-Pancrase debut at SuperBrawl 3 in Hawaii. In Brazil, things would go differently. After five minutes of intense grappling and a few uneventful takedowns, the duo was stood up by referee “Big” John McCarthy. Lober looked the more fatigued from the opening minutes, and Shamrock took advantage, landing some heavy leg kicks before a straight right dropped Lober. Rather than jumping on his opponent, Shamrock let Lober up, but not for long. Still rocked from the punch moments before, Lober would take a couple of knees from Shamrock before being taken to the ground and submitted via punches at the 7:40 mark. It was his third and final title defense of the year, before he would defeat Tito Ortiz and vacate the title in 1999. Shamrock’s Brazilian debut would be his penultimate fight in the UFC, giving the country their piece of one of the greatest fighters in MMA history. The fans in attendance would get treated to another bit of history as well. The inaugural UFC now-welterweight/then-lightweight title was won by Pat Miletich at UFC Ultimate Brazil, as he defeated Mikey Burnett via split-decision after 21 minutes. Miletich, fresh off of winning the now-welterweight/then-lightweight tournament at UFC 16 earlier in the year, was primed for the title-shot. Miletich made the opportunity count, defending his belt four more times in the promotion following the lone Brazilian bout of his storied career. Oh, there was also a couple of young up-and-comers on the card you might now know a little about. Ever heard of Vitor Belfort and Wanderlei Silva? Both fighting in the seventh bout of their careers, the duo were 21 and 22-years-old respectively going into the then-middleweight/now-light heavyweight bout. 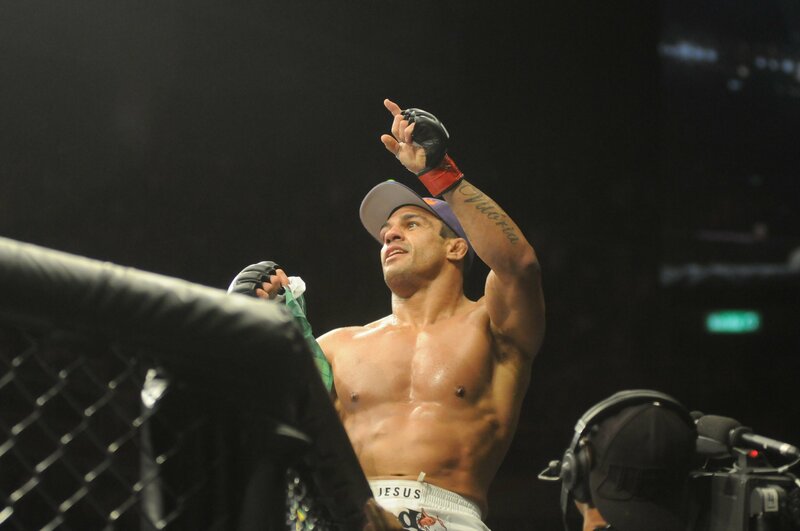 While it was a shoe-clad Belfort’s debut in his home country, all of Silva’s bouts had come in Brazil. That didn’t matter. Just 44 seconds into the fight, it was over. The first exchange is all it would take, as a quick straight left that snapped Silva’s head back would turn into a blur of fists. With Silva backpedaling, Belfort’s flurry was relentless, driving Silva to the cage, and then the ground, as referee “Big” John McCarthy ran in to stop the fight. Belfort and Silva would go on to record many more memorable moments throughout their careers, but few are as noteworthy as their clash at UFC Ultimate Brazil. The final three fights on the main card featured 24-year-old Brazilian Pedro Rizzo making his UFC debut in style, knocking out the legendary Tank Abbott a little more than eight minutes into his sixth career bout. There was also Tsuyoshi Kohsaka defeating Pete Williams to advance in the heavyweight tournament via decision after 15 minutes, and Jeremy Horn suffering one of the first few losses of his now 100+ fight career via standing guillotine at the hands of Ebenezer Fontes Braga 3:27 into the bout. Nearly 20 years later, Brazil’s impact on the promotion is still being felt. We’re excited to celebrate that fact this weekend with UFC 212, and are happy to thank UFC Ultimate Brazil’s historic card for a good start to a great relationship. Born and raised in the Northwest, Heath fills his time with writing, friends, music, and sports. Just a jobber trying to get over.